Hoa Binh (VNA) – The northern province of Hoa Binh and the Lao province of Luang Prabang have agreed to strengthen their friendship and cooperation. 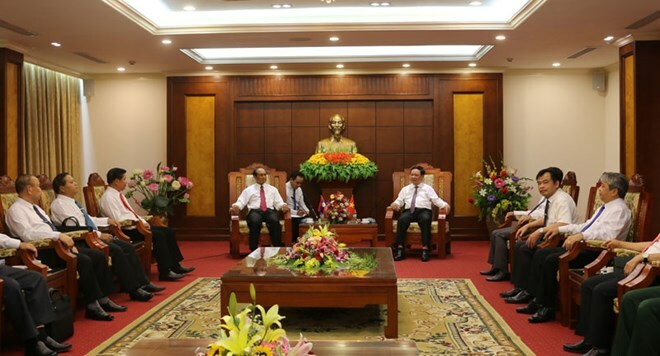 The consensus was made at the working session on August 26 between Secretary of Hoa Binh’s Party Committee Bui Van Tinh and visiting Secretary of the Party Committee and Governor of Luang Prabang Khamkhanh Chamthavisouk. They also agreed to intensify cooperation in tourism, agriculture, hydropower generation, and build an information exchange mechanism. At the meeting, the two leaders informed each other of their provinces’ 2016-2017 socio-economic development.